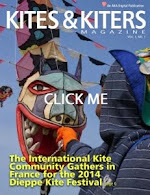 Tako Kichi (Kite Crazy): The 1st Sunday of November was great kite weather! The 1st Sunday of November was great kite weather! Sunday left nothing to complain about unless it was the loss of an hour of daylight at the end of the day (fall back). Jim Stainback and I arrived at Wildwood Park about 11:30 AM and while we were putting up banners Rhonda Davidson and Mike Hagen showed up. By noon we had several single-line kites in the air. Winds for the afternoon were in the range of 11-14 mph out of the NW to NNW (good 'ol Chico wind bouncing off the foothills). Unfortunately I was so into flying I didn't get out my camera until Mike suggested we set up my Goblin 6-pack and have some two-line fun. If I can get any photos of our single-line kites I'll add them to the post.